Functional languages like Haskell, OCaml or Erlang based Elixir are difficult to learn when you come from an imperative or object oriented languages. Concepts like immutability, high order functions or monads are very difficult to implement in classical languages (let's call them that way). Thankfully, those functional languages share a lot in common and i'll try to introduce to the most important concepts behind them. This kit is not a learning guide, and knowing those patterns will not teach you the specifics of each langugages. The road to mastering functional languages remains a hard path to take! "hello " <> x = "hello world" # x == "world" !!! x + 1 = 34 # oups! Fig 2: Compilation error on a naive pattern matching usage. 12  -> "Hey! that's young!" 21  -> "You can vote in the UK!" _   -> "Hmm that's boring"
Notice the _ underscore notation which matches any value, you're going to see it a lot if you start learning functional languages. stupidRemark 12  = "Hey! that's young!" stupidRemark 118 = "No kidding?!" stupidRemark 21  = "You can vote in the UK!" stupidRemark _   = "Hmm that's boring"
stupidRemark 12 -- returns "Hey! that's sweet"
You will see pattern matching everywhere in functional programming. It's a simple way of writing how you want to manipulate the data, but we'll come back to it later. | age < 13            = "Hey! that's young!" | age > 117           = "No kidding?!" | age > 20 && odd age = "You can vote in the UK!" | otherwise           = "Hmm that's boring"
stupidRemark 110 -- "Hmm that's boring"
stupidRemark 119 -- "No kidding?!" stupidRemark 71  -- "You can vote in the UK!" As you can see, guards allow to create much more complex conditions without a lot of boilerplate code. Beware though as they allow a limited number of operations, especially in Elixir. The reason you won't see guards as often as pattern matching is that they do not assign variables, they are very practical as if replacement. And guess what?! You can pattern match with this syntax on lists! I hope you understand better recursion in functional languages. Those pattern are so common they have utilities to write them quickly. It's out of the scope of this article, but you'll cross them when you'll learn one of those language (you might even already know map or reduce as they are now available in other languages). This chapter is pretty low level, you don't need to read it if you trust functional languages. This is not a very representative example of course, but it introduces to the type of optimisations the compiler can perform on an immutable language. Virtually, you could even optimise concurrent computation with a full immutable and pure language (apart from obscure concurrent languages like ANI). If you thought immutability would hit your performances, it's not the case. Ocaml has very similar performance benchmark to Java in the CLBG. 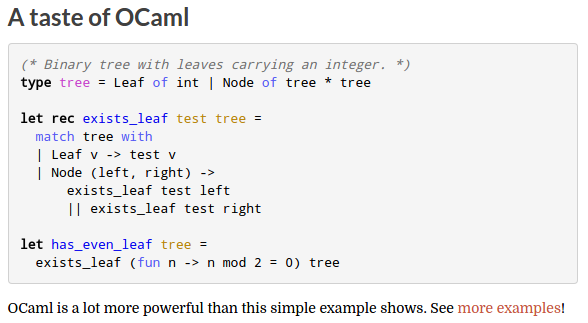 Really OCaml? It's the simplest example you could pull out?! Concepts in functional languages are very weird and different from object oriented languages. But they should not be fear you out! I hope that with this kit you'll get yourself up and learning some functional niceties!